You can’t tell me that some of your most-favorite girlfriend memories didn’t somehow involve a slumber party. Spending an evening with your favorite gal pals in comfy PJs, gabbing and enjoying your evening together…. I’m sorry; life just doesn’t get a lot better than that! Now, whether your guests’ ages are somewhere between 4 and 40 (and up – but we all stop at 40, right, ladies?? 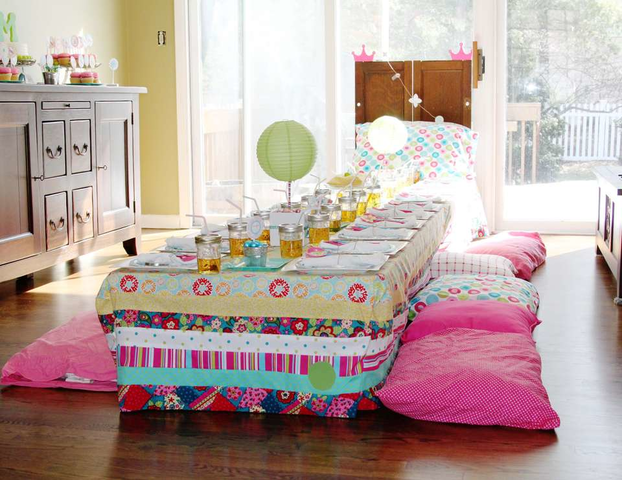 ), I have some tips for you on how to throw the perfect slumber party. Invite your closest and most best-est friends. It isn’t the overall number of people who come, it really is more about making something special for you and your besties. If you are helping your daughter throw a slumber party, carefully talk through the guest list. It’s all in the details. Consider gifting everyone with matching pajamas, silk pillowcases, or sleeping masks embroidered with their initials. It’s the ultimate gift and will remind them of the fun for years to come! Take photos before all the mayhem begins, and consider using that as a post-event postcard that thanks your guests for coming and reminds them of all the fun! Entertain! Consider playing out your theme with games, and do everything from board games to limbo – whatever fits into your vision. Prior to the party, ask guests to name a favorite song or two and create a playlist for a dance jam session. Finish the evening with age-appropriate movies (a few of our favorites that are appropriate for teens and up: Girls Just Wanna Have Fun, Grease, Clueless, The Princess Bride, Frozen – the list goes on and on). For the littles, an array of Disney or Pixar flicks should do the trick. Food and snacks are all part of the ambiance! You can create your own s’mores bar or make your own mini pizzas on English muffins. Or, if you are like me and know where my strengths are and are not…. hire an expert! Bring in somebody to make a fire pit in your yard with personalized s’mores, or consider hiring a chef or local culinary student to give a class at the party. For movie time, grab neat trays that can be personalized with everyone’s name so that every lady has her own (hands off my s’mores, girls! ), and consider a fun, giant tub of popcorn for everyone to share. Popcorn fight, anyone? Pick party favors in your own style. I know a woman who, every year, decides with her daughter what the “gift of the year” will be. Then, she stocks her gift closet with this one gift and makes sure to give the gift those special touches like beautiful wrapping paper, big bows and monograms that represent her or her daughter. It’s like their own personal brand, and it’s easy and fabulous. Pick a beautiful party favor for all your girls – something they can hold onto! Morning-after sustenance. Don’t forget that all-important brunch nosh the morning after! Make that bacon, honey! A brunch-style send-off is a perfect way to send guests on their way with a full belly and a lifetime of memories. It’s party time!!! Sit back, relax and make some memories! What is your favorite slumber party must-do? Send it along, girl! Previous Post Hello World, Meet Monica Wilcox! Next Post Perfect Party Tips for Your Gathering!